The researchers studied the boys’ reading performance for an average of 4.2 months - and found that their reading age improved by 8.4 months during that period.Girls also improved at a better rate than the norm - showing a 7.2 month improvement. The study went on to show the percentage of boys who found reading difficult halved from 28 per cent to 15.9 per cent. It's a pretty nifty report, and if you want to read more you can find coverage in The Telegraph, the Independent, or Teleread. You can also find the entire report on the NLT's website (PDF). But as I was reading I found a couple details that I think most would miss, to their detriment. 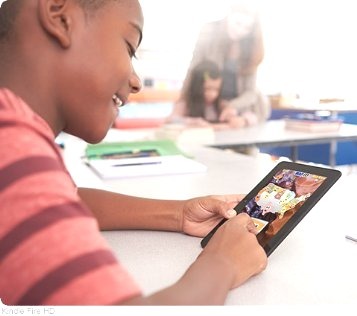 While it would be easy for me to join the "ebooks are wonderful and boost reading skills" hype and start pumping up the next tech bubble (this time in edtech), the reality is that digital reading tech isn't ready yet for widespread adoption in the classroom. The technology works, but it's not seamless, easy, cheap, or sturdy enough. As noted in ‘School recruitment and retention’, several challenges occurred over the course of the study that affected the quantity and quality of the data received. Firstly, our intention was to involve around 100 schools in the study. We received more than 250 initial expressions of interest from schools, but as noted, unfortunately fewer than 100 schools responded to follow-up instructions relating to getting started with ebooks and surveying pupils. Where it was possible to establish reasons for the low response rate, the most frequently cited were budget restrictions, technology issues (e.g. limited access to hardware and wifi) and staff capacity. A considerable number of schools did move to the next stage of the study, however, and we received pre-project attitudinal data from more than 1,000 pupils. A number of schools went on to withdraw at a later stage of the study period (again, most commonly citing developing or ongoing issues around capacity and technology). Furthermore, there was a period of several weeks in the middle of the study during which the RM Books app was unavailable due to delays with an update. This affected schools that were offering pupils access to the platform through the app rather than online. In addition, particularly for schools new to using this ebooks platform, getting pupils set up on the system often took longer than anticipated. These factors reduced the amount of time that schools had available to offer ebooks to pupils by either weeks or months, within the context of an already limited study period. If the schools didn't have problems with funding, they ran short on staff. and if they had enough teachers, they couldn't get the devices to work. And if they could get the tech to work, they lost time in teaching the students the basics about using it. And if that didn't slow things down, the reading programs were tripped up by misbehaving software updates. While I love ebooks, I am also aware that the tech I use to read for enjoyment simply isn't as good as it has to be if we want to use it in a high stakes, time sensitive environment like classrooms. An ebook platform can't simply crash during finals, like Coursesmart did in 2013. It can't simply stop working just because the average student has a slow internet connection at home, a problem Fairfax Public Schools encountered in 2013. And the tech needs to work better than Amplify's first tablet, which was returned en masse due to basic QA failures. Sadly, these stories are all too common, and with tech performing on that level we might as well stick with paper textbooks. follow-up at the URL below. in substance. Good on Nate for publishing it. speck of that could help the endowment get started. libraries. But it would not hurt. and friends will give him another chance.